The final weld that connects the offshore and the nearshore sections of TurkStream was completed, marking the finalisation of the entire pipeline system in the Black Sea. 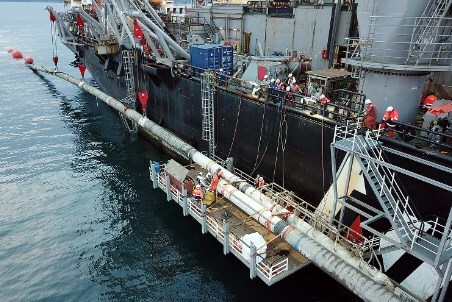 The procedure, known technically as ‘above water tie-in’, involved retrieving the nearshore pipeline and offshore pipeline from the seabed, lifting them above water and welding them together. The total weight that had to be lifted for the operation was approximately 409 t. After a thorough inspection of the weld, the pipe was carefully lowered to the seabed at a depth of 32 m. This operation was carried out on both lines in Russian waters in January and February this year, and near the Turkish coast in March. The pipelaying in deep waters was carried out by Pioneering Spirit, the world’s biggest construction vessel, while the shallow-water pipelaying was conducted by Lorelay. With the completion of the above water tie-in procedure, a physical connection between the landfall facility near the Russian city of Anapa and the receiving terminal near Kiyikoy in Turkish Thrace is realised. TurkStream is the project for a gas pipeline stretching across the Black Sea from Russia to Turkey and further to Turkey's border with neighbouring countries. The first line of the gas pipeline is intended for the Turkish consumers, while the second line is designated for the Southern and South-Eastern Europe. Each line will have the throughput capacity of 15.75 billion m3/y of gas. South Stream Transport B.V. is responsible for the construction of the gas pipeline's offshore section.